Chocolate fondues are delicious and tantalizing treats which are used for special moments or occasions. You don’t need to go to so much process to have one. All you need to do is to select the chocolate you like best for melting and go ahead to enjoy yourself. There are so many simple techniques that you can use to melt your chocolate fondue. In this write-up, we are focusing on how you can melt your chocolate in a fondue pot so as to ensure a successful outcome. Flavors of toffee, espresso, and Kahlua although they are not compulsory. Select the particular chocolate that would like to melt. You don’t need to fear that the chocolate you chose might be difficult to melt. Rest assured because no matter the type of chocolate you select, all of them will follow the same melting process. Do not allow water to get near to your chocolate before melting. This can cause the chocolate to harden or freeze over thereby spoiling the texture of the chocolate and its consistency. Then add like 12-ounces of the chocolate you have selected in the fondue pot. It is important to always set your chocolate on a low heat. This is because; overheated chocolates tend to appear dry and crumbly when you look at them. Therefore, if you don’t want to have this type of result, make sure to use low heat and slowly melt your chocolate. Adding cream or 2 drops of vegetable oil to the chocolate can help you to save it from burning. You don’t need to add much just a little amount of the oil to help add moisture to the chocolate. You can then begin to stir the chocolate fondue as it starts melting. If you find out that the heat has already melted the chocolate, you can reduce the heat. 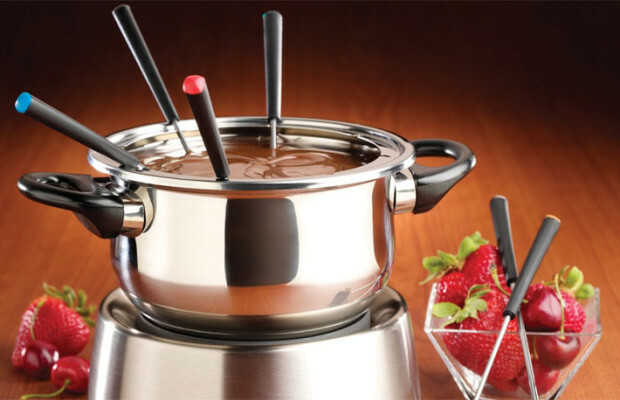 The result of your effort will be a pot full of chocolate fondue that is rich, creamy and highly delicious. It is then the time to add the dipping materials like the fondue fork or fruits like strawberries. It is important to begin the dipping process immediately you are through with melting the chocolate. Remember to dry any of the items you want to dip into the melted chocolate are dry to prevent the chocolate from seizing. Make sure that the preparation of the chocolate for melting takes about 5 minutes. Remember that you can only cook the chocolate fondue for about 10 minutes which will add up to 15 minutes with the preparation. You can then pour the chocolate in your fondue pot that the under is lit with the servo. Add any flavor of your choice although it is not compulsory. You are free to start dipping with the items you want to dip with. These simple methods will enable you to melt your chocolate in a fondue pot. You may have thought that it is a difficult style since you are used to using other methods. I can assure that this will save you some time and energy.